A five-year-old boy suffered life-threatening injuries when a suspected learner driver ran him over before smashing into a house. The boy is said to be in a critical but stable condition after being hit in Gabriel Street, Saffron Walden, Essex. One neighbour told BBC Essex she believed the boy had been "dragged quite a way" across the road. An Essex Police spokesman said: "Police believe the driver was a learner and there were L-plates on the vehicle." The driver of the car, a Renault Megane, and a passenger have been voluntarily interviewed by police. Inquiries are continuing. Officers want to speak to any children accompanying the boy at the time of the accident, which happened shortly before 17:15 GMT on Wednesday. It is understood the occupants of the house have had to move out due to structural damage. 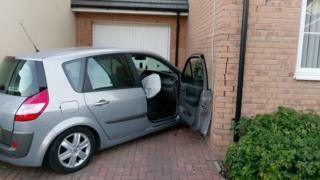 Neighbour Kim Harris told BBC Essex: "I heard acceleration, tyres screeching and then a crash, bang. It made the house shake. "I noticed the car first, then noticed the boy a couple of yards away. He was scooped and handed to the parents as they came running out. "It was mayhem, there was lots of people shouting and screaming. He'd been dragged, I think, quite a way."